when sv-pow becomes more discussion about human things and less discussion about ancient monsters i bombard your email with whatever crappy unfinished dino-drawings i got lying around. 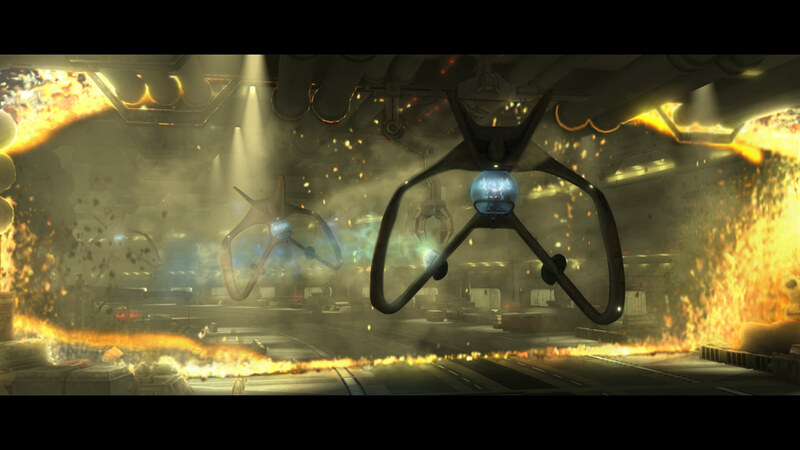 you have my permission to do with these as you wish, however if they end up on SV-POW i will be happy and feel i’m doing my part to combat humans. 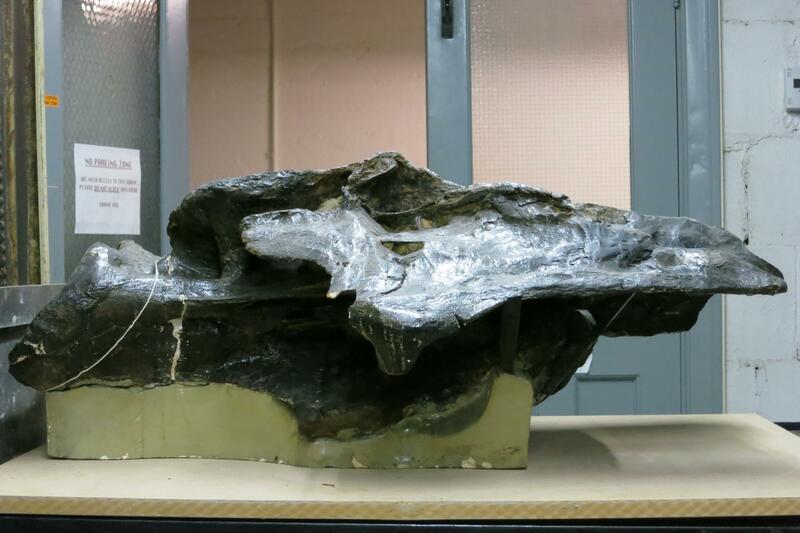 Happy new year, sauropod fans. Enjoy this rearing Dicraeosaurus courtesy of Brian. 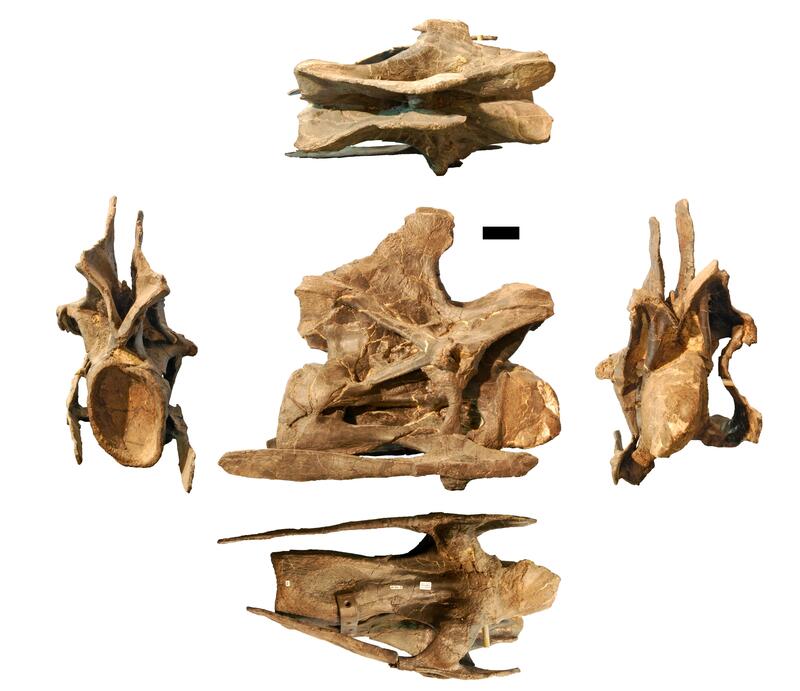 A couple of days ago, a paper by Tschopp and Mateus (2012) described and named a new diplodocine from the Morrison Formation, Kaatedocus siberi, based on a beautifully preserved specimen consisting of a complete skull and the first fourteen cervical vertebrae. Unfortunately, the authors chose to publish their work in the Journal of Systematic Palaeontology, a paywalled journal, which means that most of you reading this will be unable to read the actual paper — at least, not unless you care enough to pay £27 for the privilege. Tschopp and Matteus (2012: figure 9). 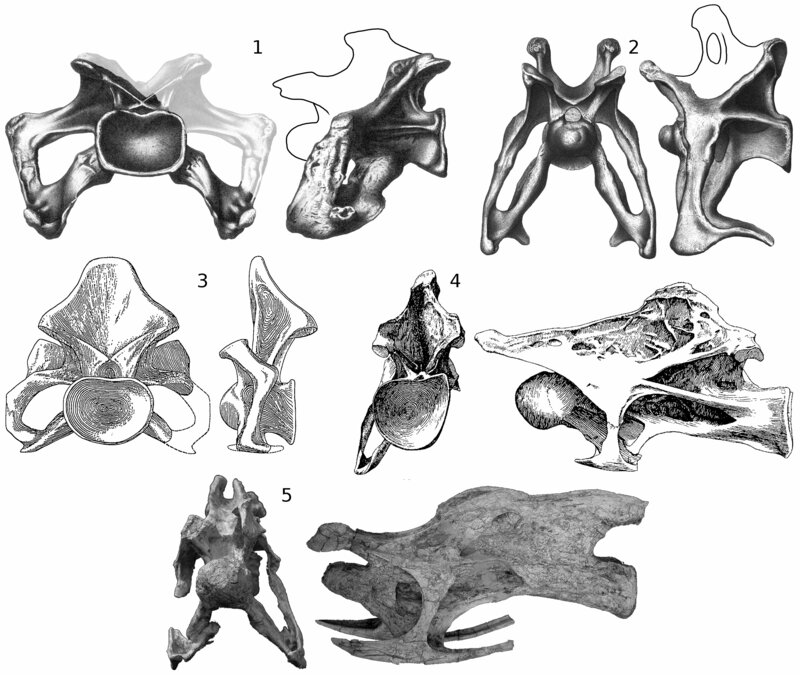 A, Photograph and B, drawings of the mid-cervical vertebrae of the holotype of Kaatedocus siberi (SMA 0004). Photograph in lateral view and to scale, CV 8 shown in the drawings is indicated by an asterisk. Drawings of CV 8 (B) in dorsal (1), lateral (2), ventral (3), posterior (4) and anterior (5) views. Scale bars = 4 cm. 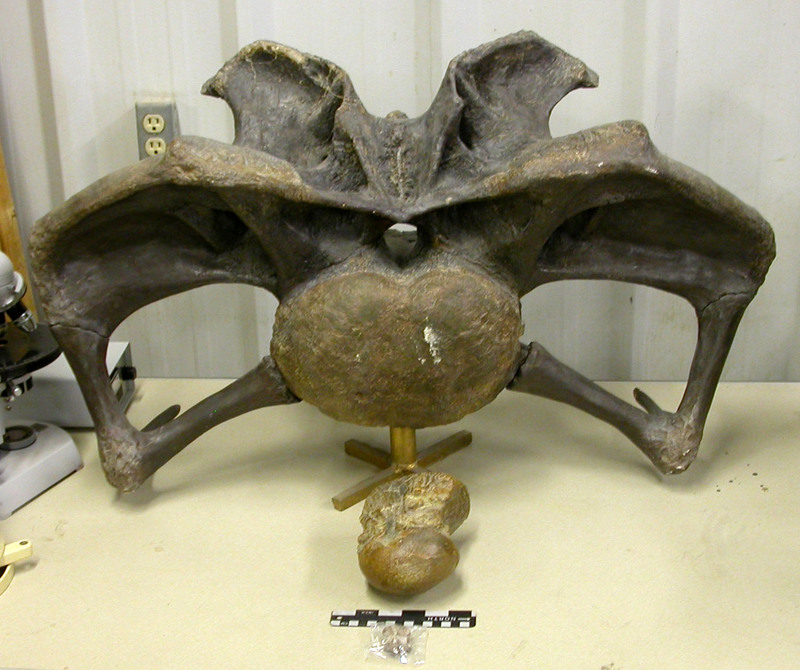 It should be immediately apparent from these lateral views that the vertebra are rather Diplodocus-like. 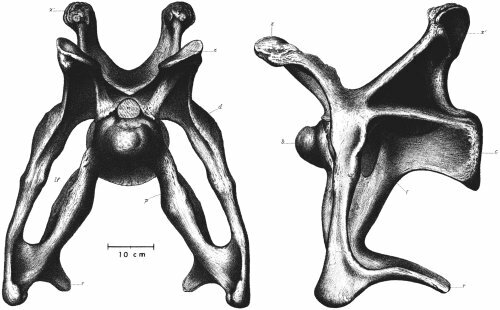 But the hot news is that there is a great raft of free supplementary information, including full five-orthogonal-view photos of all fourteen vertebrae! It’s just a shame that all the awe-inspiring illustrations are tucked away in supplementary information rather than in the paper itself. Had the paper been published in a PLOS journal, for example, all the goodness could have been in one place, and it would all have been open access. There’s a bit of a fashion these days for drive-by synonymisation of dinosaurs, and sure enough no sooner had Brian Switek written about Kaatedocus for his new National Geographic blog than comments started cropping up arguing (or in some cases just stating) that Kaatedocus is merely Barosaurus. 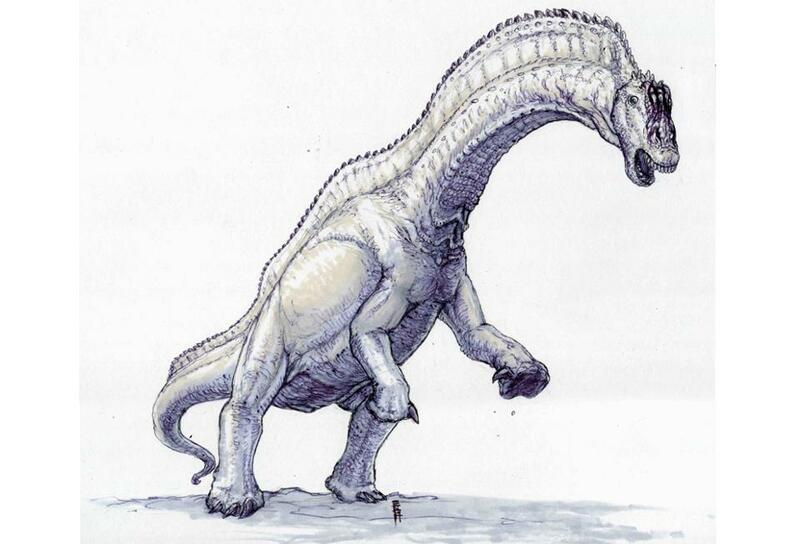 Even allowing for a certain amount of post-mortem distortion and “creative” restoration, it should be immediately apparent that (A) Barosaurus is much weirder than most people realise, and (B) Kaatedocus ain’t it. There may be more of a case to be made that Kaatedocus is Diplodocus — but that’s the point: it there’s a case, then it needs to be actually made, which means a point-by-point response to the diagnostic characters proposed by the authors in their careful, detailed study based on months of work with the actual specimens. 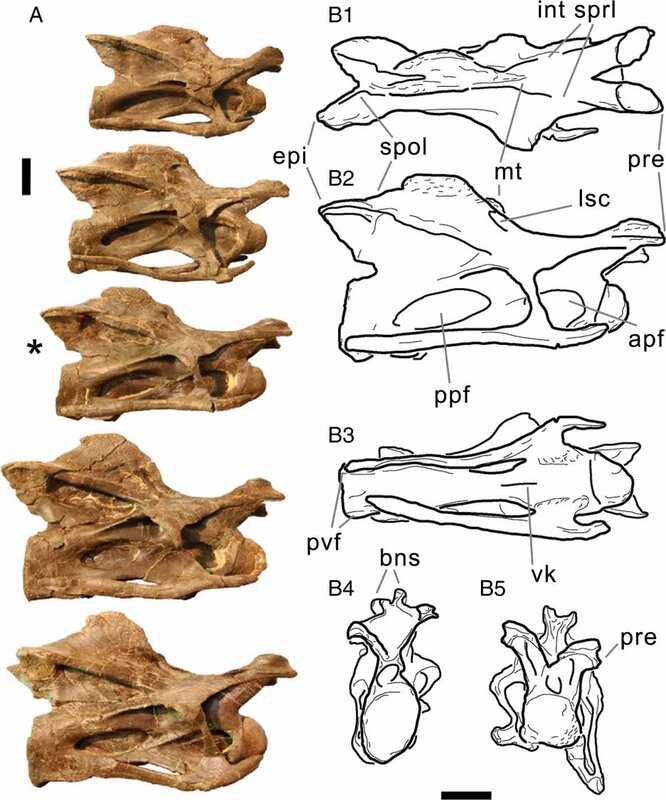 There seems to be an idea abroad at the moment that it’s somehow more conservative or sober or scientific to assume everything is a ontogenomorph of everything else — possibly catalysed by the Horner lab’s ongoing “Toroceratops” initiative and subsequent cavalier treatment of Morrison sauropods — maybe even by the Amphidocobrontowaassea paper. Folks, there is no intrinsic merit in assuming less diversity. Historically, the Victorian sauropod palaeontologists of England did at least as much taxonomic damage by assumptions of synonymy (everything’s Cetiosaurus or Ornithopsis — whatever that is) as they did by raising new taxa. The thing to do is find the hypothesis best supported by evidence, not presupposing that either splitting or lumping is a priori the more virtuous course. 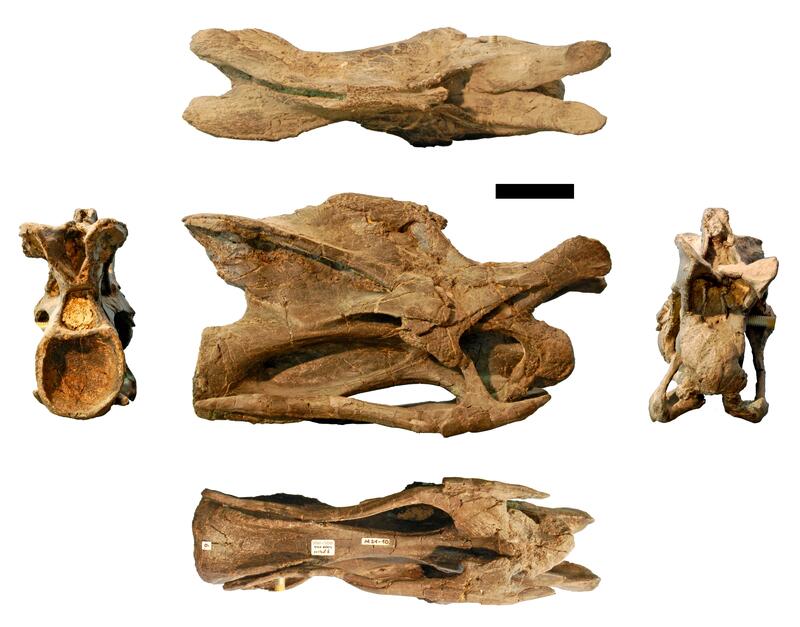 As we’ve pointed out a few times in our published work, sauropod diversity in the Kimmeridgian-Tithonian in general, and in the Morrison Formation in particular, was off-the-scale crazy. 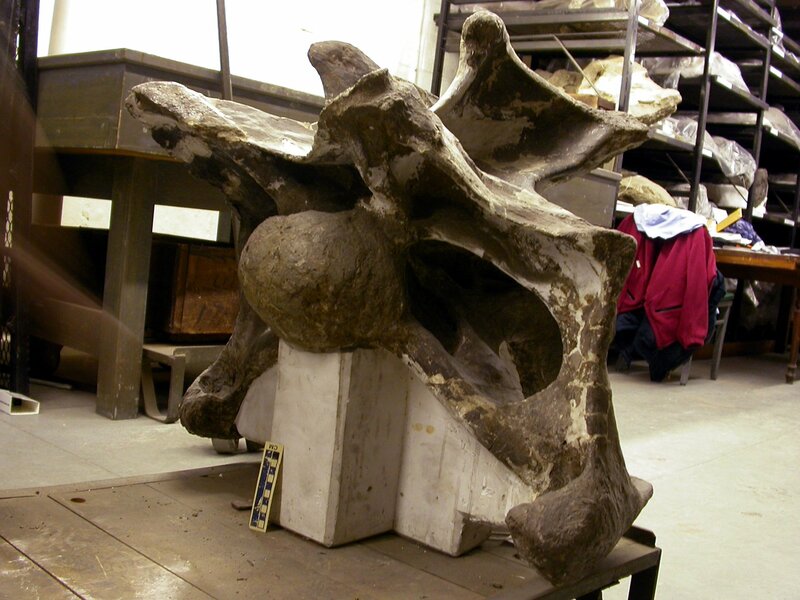 There’s good evidence for at least a dozen sauropod genera in the Morrison, and more than fifteen species. Kaatedocus extends this record yet further, giving us a picture of an amazing ecosystem positively abundant with numerous species of giant animals bigger than anything alive on land today. Sometimes you’ll hear people use this observation as a working-backwards piece of evidence that Morrison sauropods are oversplit. Nuh-uh. We have to assess taxonomy on its own grounds, then see what it tells us about ecosystem. As Dave Hone’s new paper affirms (among many others), Mesozoic ecosystem were not like modern ones. We have to resist the insidious temptation to assume that what we would have seen in the Late Jurassic is somehow analogous to what we see today on the Serengeti. Hutton’s (or Lyell’s) idea that “the present is the key to the past” may be helpful in geology. But despite its roots as a branch of the discipline, the palaeontology we do today is not geology. When we’re thinking about ancient ecosystems, we’re talking about palaeobiology, and in that field the idea that the present is the key to the past is at best unhelpful, at worst positively misleading. 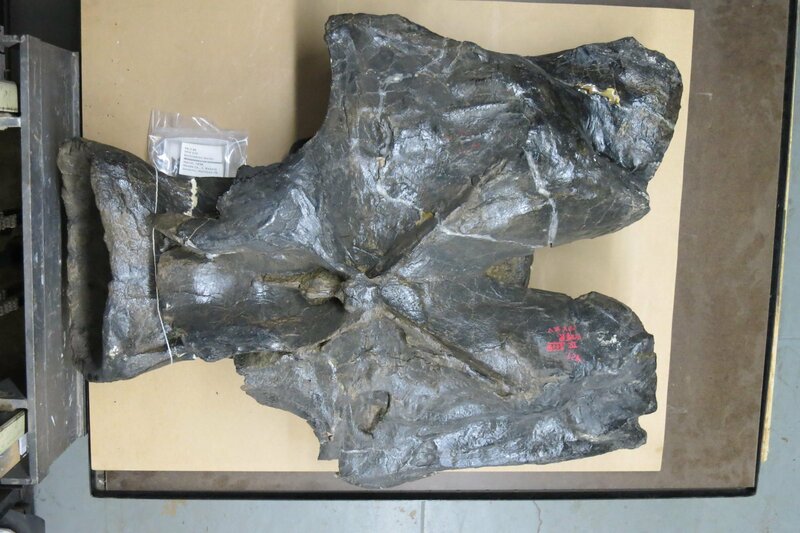 But isn’t the Kaatedocus holotype privately owned? You’ve had two sermons already, I’m sure we can all agree that’s plenty for one blog post. 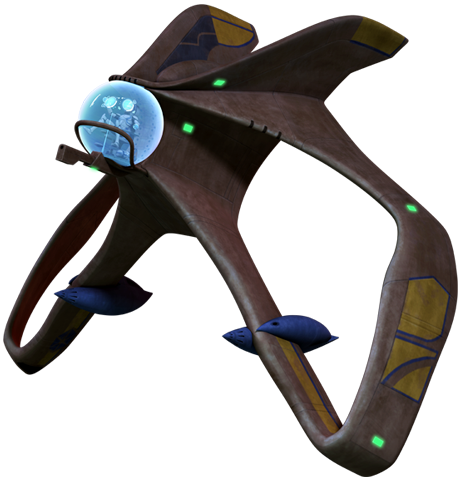 I will return to this subject in a subsequent post. Sermon doesn’t even get started. What has higher energy output than a hummingbird? Not surprisingly, hummingbirds have the highest energy output per unit of weight of any living warm-blooded animal. The wording struck me as strange: highest of any living warm-blooded animal? Is Wood just being redundant here, or is he implying that there are cold-blooded animals with a higher mass-specific metabolic rate? The idea seems inherently contradictory, doesn’t it? I wondered whether he might have insect flight in mind? Am I making a mistake in conflating “energy output” with “metabolic rate”? Here’s my take on the widely used Creative Commons Attribution licence (CC BY) in contrast to more restrictive CC licences such as the Non-Commercial variant (CC BY-NC). It may be true, as Martin suggests, that CC BY-NC is better for the author than CC BY. But authors are part of a community, and it’s unquestionably better for the broader community that CC BY be used. It’s better for society that commercial applications of the author’s research be allowed and encouraged. So long as researchers are funded by that broader community, it’s fair that funders should be able to mandate the more permissive licence, which is better for society. If we kick back against that — if we say it’s not enough to be paid to do research, we also want a slice of the commercial uses of our work — we only perpetuate society’s ivory-tower stereotype of academics who think the world owes them a living. So while there is certainly an argument to be made that CC BY is also better for the researcher, I think that whether that’s true or not, simple justice requires that no additional restrictions be placed on such work.